was telling them of all the health related products I was packing- and they laughed at me for going over the top. It got me thinking- how much is too much?? Especially if space is limited. As a nurse I don't want to be caught short and waste my precious holiday time hunting down products, in a country where I may not speak the language. Last year I wrote about how to adapt hotel amenities to make emergency skin and beauty products- this is still a stable habit for me I must confess! My next trip is purely for relaxation to an island resort -I don't have any particular medical conditions ,neither does my son apart from hayfever and occasional asthma. 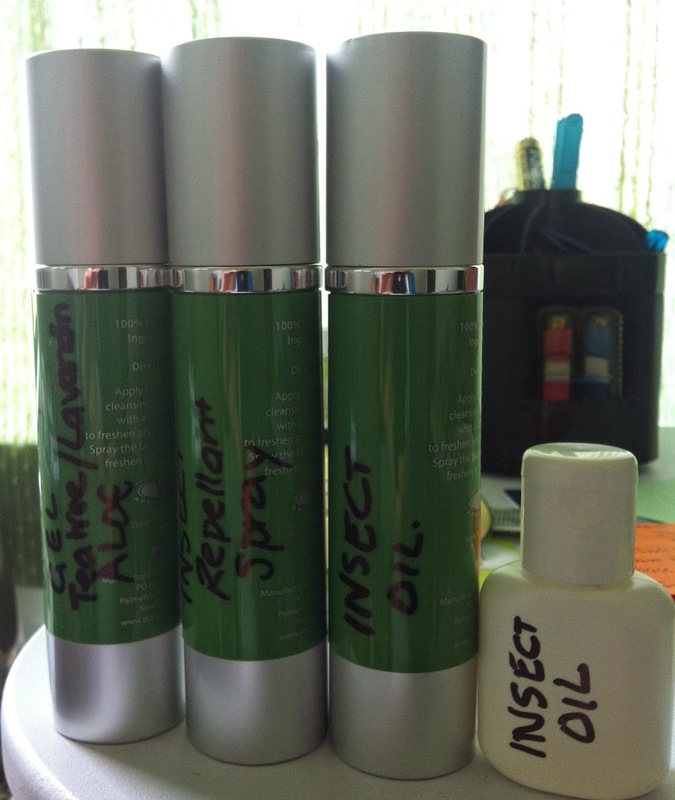 Home made Insect repellent - recipes here If you can't take your own then I recommend Goodbye Sandfly products. However * if you are going to an area where Dengue fever, malaria and other insect borne disease are then please follow the travel advisories as supplied by the government. if you are in Singapore or Malaysia I recommend this brand from Organic Basic. An all purpose healing gel with organic teatree oil and lavandin oil and fragonia oil which has antiseptic properties, will help with any itching and minor cuts and bites. if you would like to make your own then this gel base is the perfect place to start! So is that an over kill? On previous (longer) trips I have also take a full course of anti biotics and an antiviral cream (cold sores) and various other things like blister plasters. So what about holiday skincare- do you use as many products as home or do you tend to go more au naturale? Apart from sunblock which is a holiday must I tend to go very low key preferring lip glosses over lipsticks, maybe a primer with a touch of light powder foundation highlighter.I try and use products that have more than one function. A travel essential for my is a toner spritzer which is great to refresh on the plane and rehydrate your kin or spritz on your hands. I usually decant into a small 50 l spray bottle and carry on board. This blog has some other great travel tips for those in the business who do a lot of it! And at the end of the day - a holiday is for realxing and what can be getter for the skin (and the mind and the body) than relaxation!